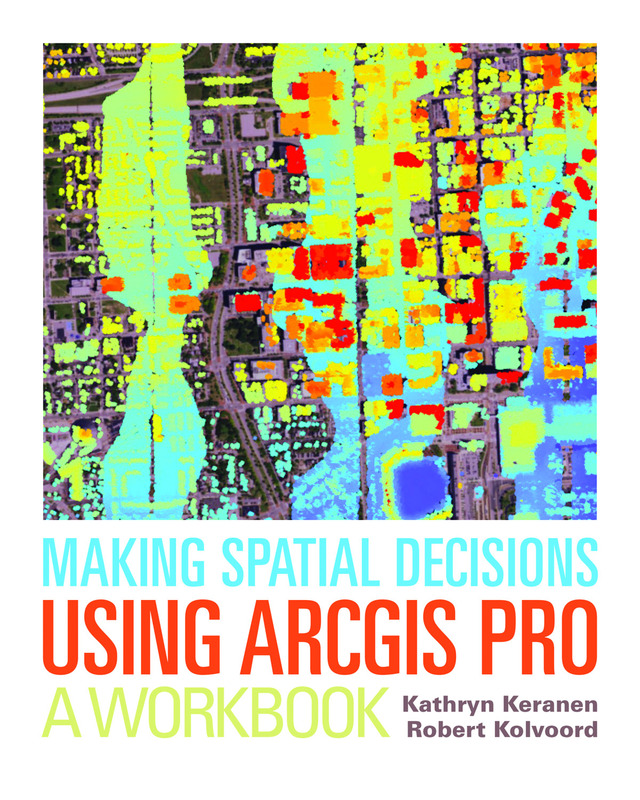 Redlands, California—Making Spatial Decisions Using ArcGIS Pro: A Workbook, newly published by Esri, teaches how to use geospatial analysis tools in Esri's ArcGIS Pro software to solve real-world problems in fields such as emergency management, law enforcement, urban development, and renewable energy. The workbook, written by educators Kathryn Keranen and Robert Kolvoord, is project based and incorporates The Science of Where into the lessons. Readers will use the geospatial analysis tools in ArcGIS Pro—along with vector, remote-sensing, and lidar data—to perform analyses and make maps. The projects were designed for instructors or students of geospatial technologies to use in a college, university, or high school setting, although anyone who uses geographic information system (GIS) technology will find Making Spatial Decisions Using ArcGIS Pro educational and useful. The workbook includes 18 projects that cover real-world scenarios. Readers will use ArcGIS Pro and the data provided to manage incidents such as hazardous materials spills, decide what areas were the hardest hit by a hurricane to properly allocate disaster aid, and analyze crime patterns to determine where to step up patrols. While ArcGIS Pro is the primary tool used to complete the lessons, readers will also use Esri ArcGIS Online to access data and publish and share their work. 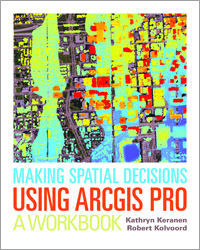 The lessons included in this workbook were updated for use with ArcGIS Pro, having been adapted from the authors' popular Making Spatial Decisions series of workbooks: Making Spatial Decisions Using GIS, Making Spatial Decisions Using GIS and Remote Sensing, and Making Spatial Decisions Using GIS and Lidar, all published by Esri. The authors use proven teaching methods so that students immediately apply what they learn as they progress through the lessons. The workbook comes with GIS data, access to ArcGIS Pro software, and other materials needed to complete the projects. Making Spatial Decisions Using ArcGIS Pro: A Workbook is now available in print (IBSN 9781589484849, 290 pages, US$69.99). The print edition of the book can be obtained from online retailers worldwide or by calling 1-800-447-9778. The e-book edition is available for purchase from online retailers. Outside the United States, visit esri.com/esripressorders for complete ordering options, or visit esri.com/distributors to contact your local Esri distributor. Interested retailers can contact Esri Press book distributor Ingram Publisher Services.